Our antistatic bubble wrap is manufactured as a co-extruded barrier bubble, a packaging material that retains its air and cushioning power much longer than non-barrier bubble. This technology prolongs the life of the bubble, providing protection during packing, shipping and storing. 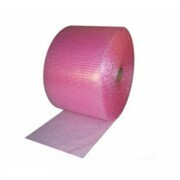 Antistatic bubble wrap dissipates surface charges and prevents the build-up of static discharge. Yellowbox is a supplier of bubble wrap as well as many other Packaging related products like Carton Boxes, Stretch Film, Strappings, Loose Fills / Air Bags and Pallets for all your packaging and warehousing supply needs.